Each day (weather permitting) we will be hiking back to the Lake, Big Creek and kayaking. We will be starting at 10:00 each morning and ending at 3:00pm. Please have a packed lunch and extra clothes. If weather is too nasty we will be staying at the Bingo Hall doing gardening, arts and crafts, games, etc. This camp is for youth ages 5 through 14. For this year’s Survival Camp, we will be kayaking to Mouse Island, staying there for two (2) nights. We will be taking daily kayaking and fishing trips, building a shelter, learning how to start fires, tying knots and cook in the wild. Kids will leave having gained skills to survive in the Alaskan wilderness. Youth ages 14 and up. From July 18 through July 22 we will be hosting a week long Marine Science Environmental Camp. Grades Preschool and up are welcome to join in on our day to day marine science activities hosted by Switguard Duesterloh. Family dinners will be provided Monday, Tuesday, Wednesday and Thursday at 5:00pm during camp. So come and explore sea critters with us! Youth ages Preschool on up. This camp will engage youth in teaching and exposing them to Alutiiq traditional and cultural relevant activities that include fishing, hunting, crafts, carving, basket weaving, skin sewing, Alutiiq Dancing, traditional cooking and storytelling by elders. In addition to these activities resource personnel from related health agencies facilitate group discussion and behavioral programs designed to assist the youth in making correct and appropriate choices. Emphasis is on traditional and cultural relevant activities with lessons geared to healthy mental and physical health. *Participants need to be aware that camp conditions are primitive, with limited facilities and access. Camps will be held rain or shine so please bring your rain gear. We are in BEAR COUNTRY. You won’t go hungry at camps: hiding food or candy in tents might encourage bears or other unwanted critters. All food for special diets need to be turned into the camp cook. Please submit applications to: Alutiiq Tribe of Old Harbor P.O. Box 62 Old Harbor, AK 99643 Phone: 907-286-2215 Fax: 907-286-2350 Email: [email protected] Alutiiq Tribe of Old Harbor camps are funded through grants and donations. If you would like to make a donation to Alutiiq Tribe of Old Harbor, please contact our office or include it with your registration packet. Release and Waiver Form Acknowledgement of Risks Agreement for Release of Liability and Indemnification In consideration of being allowed to participate in ATOH’s camp programs and related activities, the undersigned agrees as follows; 1. I recognize that there is a significant element of risk in any outdoor adventure, sport, or activity such as the one in which I am enrolling. Those risks may include but are not limited to: sickness; personal injury; loss or damage to personal property; permanent trauma; or death. Due to camp’s wilderness and remote location, adequate medical or emergency care may not be readily available. agree not to sue, the Alutiiq Tribe of Old Harbor and The Old Harbor Native Corporation, their agents, contractors, officers, directors and employees from any and all claims, losses or damages of any kind by reason of injury or damage to person or property, including death, sustained at any time (now or in the future) in connection with participation in our camps or any related activities, whether or not resulting from or caused to any degree by negligence, the condition of land, errors or omissions by other participants, or from other or unknown causes, except to the extent such injury or damage is solely resulting from or caused by the active gross negligence or willful misconduct of the person released. I agree to indemnify and defend the Alutiiq Tribe of Old Harbor or The Old Harbor Native Corporation and all other released persons against all expenses, including attorney fees and court costs, that they may incur as a consequence of any claim that I have waived or that they may suffer as a result of a claim by someone else because of my conduct. 3. I am also aware that there are no medical facilities, physicians, or medical personnel available within the immediate vicinity of the planned activities. If any family member, including minor children, or I require medical care or are evacuated from an activity for any reason whatsoever, I consent to emergency medical treatment as may be necessary. I also agree to pay for and be responsible for all costs and fees connected with the medical care or evacuation. I have read, understand, and accept the terms of this waiver and release. I am aware that this is a legal, binding document giving up substantial legal rights, and I sign it voluntarily. I understand I can decline to sign this waiver and release, and not participate in the camps and related activities. If I am signing on behalf of a minor child, I represent that I have authority to do so and I will indemnify and defend the Alutiiq Tribe of Old Harbor or the Old Harbor Native Corporation and all other released persons against any claims asserted by or on behalf of the minor to the same extent such claims are released by this Release and Waiver. Youth-Parent Agreement As a participant of the Alutiiq Tribe of Old Harbor’s Camp Program, I ___________________________________, agree to the following: 1. I agree to attend and participate in all agenda activities to the best of my ability. 2. I understand the conditions and dangers of not being at home and therefore will make sure that I check in with the chaperones at all times and let them know my whereabouts. That includes staying with my buddy during outings and listening to the chaperones. 3. I agree to live respectfully. This includes doing my best, being polite and kind, never hurting others or myself with words or actions, respecting the rights and property of others and cooperating. 4. I understand that other participants may disclose sensitive information during the camp and I agree not to use this information in a harmful way. I agree to keep the names of other participants and the information disclosed during this camp confidential. 5. I will not bring any inappropriate substances during this camp, nor will I use any inappropriate substances during this camp. This includes medication of any kind, alcohol, tobacco, inhalants, or illegal drugs. 6. If someone at camp is bothering or hurting me in any way, I will inform the camp manager immediately so I can concentrate on having fun and learning. 7. I will try to solve the smaller problems myself by following these choices:  Tell them to stop  Walk away, wait and cool off  Share and take turns  Ignore it  Apologize 8. I understand that camp rules prohibit: Tobacco, Drugs, Alcohol, Firecrackers, Matches, and Lighters *If the above agreement is violated, participants will be subject to modification of behavior by the camp coordinator, if this is not adhered, the participant will be sent home to the parent/legal guarding. I have read this agreement and discussed it with my parent/guardian and camper. My signature is a pledge to follow and support the rules of Alutiiq Tribe of Old Harbor programs at all times. Kayak Waiver and Release of Liability I, _____________________________________ (parent/guardian) give permission for my child, _____________________________________ (child’s name) to participate in the use of the kayaks. 3. Release waiver, discharge, and covenant not to sue the Alutiiq Tribe of Old Harbor, its affiliated clubs, their respective administrators, directors, agents, and other employees of the organization, other participants, of which are hereinafter referred to as “releases” from any and all liability to each of the undersigned, his or her heirs and next of kin for any and all claims, demands losses or damages on account of injury, including death and damage to property, caused or alleged to be caused in whole or in part by the negligence of the releases or otherwise of _______________________________(Child’s name) has or may uncur by using the kayak(s). I, the undersigned parent/guardian have read this release and understand all its items. I execute it voluntarily and with full knowledge at the Alutiiq Tribe of Old Harbor on this date; ___/___/2016. 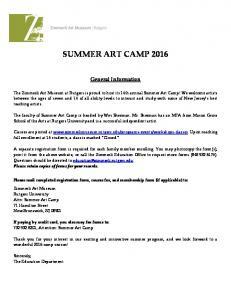 Report "2016 Summer Camp Schedule"